Head Coach Mark Richt came to Georgia with the goal of taking the lid off a program that had not won an SEC title in 20 years. After 12 seasons between the hedges, he’s demonstrated what that means by winning two SEC Championships (2002, ‘05), five SEC Eastern Division titles and tied for another, and his 118-40 record is fourth best in the country in winning percentage among active coaches (.747). And his emphasis on graduation has come to fruition as 228 Bulldog players have earned their degrees during his tenure. 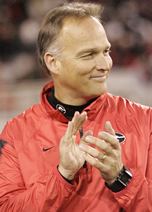 Richt was named SEC Coach of the Year in both 2002 and 2005. His record against non-conference teams is 49-8 and his teams are 41-11 when playing in an opponent’s home stadium. Richt is also one of only six coaches in history to win two SEC championships (2002, 2005) in his first five years, and one of only five head coaches in SEC history to record four straight 10-win seasons (2002-05). The respect he has nationally was demonstrated in 2010 when Richt was named to the American Football Coaches Association Board of Trustees. The excitement produced by Richt’s teams on the field has been matched by many other aspects surrounding the program. Richt has generated an atmosphere of excitement and unity among the Georgia people. Georgia supporters and fans became impressed with his sincerity, openness, family values, and the casual and genuine way he carried himself. They liked his ideas on building a football program, his commitment to discipline, and the importance he placed on standards of excellence on and off the field.